May is women empowerment month on TV5 as it celebrates Mother’s Day with a brand new afternoon block starting May 14. Fulfilling afternoons begin with a special treat for the hardworking homemakers. Sine Tanghali is a two hour screening of Tagalized Hollywood movies followed by award winning Koreanovelas and for her first show as a Kapatid, Sharon opens her arms again to ordinary people in Sharon: Kasama mo Kapatid. With gripping plots and exciting twists, Koreanovelas without a doubt are hit among Filipinos. On Monday, three of the biggest dramas in Korea are set to captivate televiewers in different stories of family, friendship, love and betrayal. White Lies is a story of Cheska and Jeremy, a young couple who is about to get married. When the Cheska got pregnant, Jeremy suddenly leaves her for a richer woman. The riveting story of a young mother begins as she bravely faces every challenge thrown at her for her child. Love You A Thousand Times, a young couple, Harold and Sandra, has been trying to conceive a child but unsuccessful. To her desperation, Sandra hires a surrogate mother, a plan unbeknownst to Harold. In a twist of fate, Eunice, the surrogate mother falls in love with the Harold’s brother, Carlo. The real drama begins with this turn of events. Pink Lipstick highlights the story of deception and betrayal. Andrea discovers that her husband, Aldwin, has an affair with her bestfriend Marivic. Adding to the shocking revelation, their adopted daughter is actually their lovechild. Now, she plans to take revenge and her once normal life is changed forever. The Mega afternoon block begins on Monday, May 14 with Sine Tanghali at 12:45pm, followed by White Lies at 2:45pm, Love You A Thousand Times at 3:15pm and Pink Lipstick at 3:45pm. 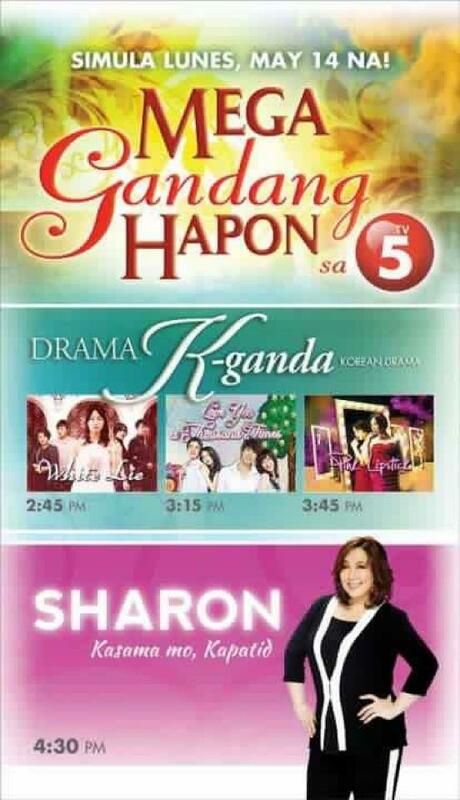 Celebrate life with real stories from real lives in Sharon: Kasama Mo Kapatid at 4:30pm only on TV5.